While this commercial isn't as good as our first Super Mario Galaxy 2 commercial, it's good for Japan. Nintendo seems to be continuing with their series of commercials starring Japanese celebs on a couch playing their latest game. This time its Kazunari Ninomiya and Masaki Aiba, both singers, actors and television personalities. The duo (Jonathan Holmes asked me to make fun of their pants) gives Galaxy 2 a spin and quickly ends up coming across a mysterious power-up. 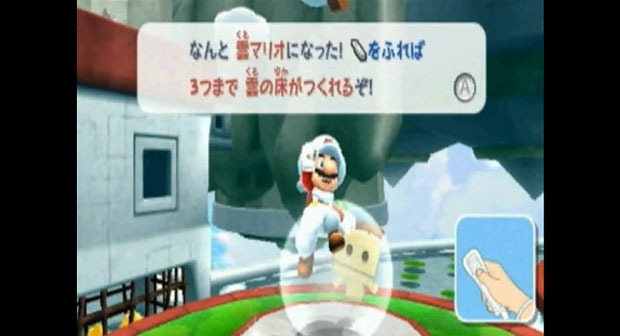 It turns out to be Cloud Mario (Kumo Mario in Japan). You'll see how the clouds form as temporary platforms, making normally inaccessible areas easy to get to. Near the end, Nino wusses out at some of the bigger jumps and Aiba has to take over.